If you walk, bike or take public transportation to class or work, keeping your stationery supplies compact and light weight is a necessity. Paper notebooks that keep you organized while at the same time reducing bulk are much appreciated! Here are a few ideas to keep you streamlined while on the go. Myndology disc bound notebooks give you the flexibility of a 3-ring binder along with the compact size of a paper notebook. Specially shaped discs with matching punched paper allow each page to be removed and then put back into these notebooks. 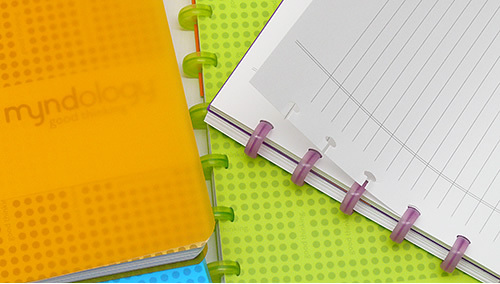 College ruled, blank and graph paper refills are available and so are folder and tab inserts that divide your notebooks into organized sections. These features are offered for both Myndology Letter (8.5″ x 11″) and Journal (6.5″ x 8.5″) sized notebooks. If you’ve never had the opportunity to try this style of notebook, take a look at our previous blog post that answers frequently asked questions about disc bound notebooks. Clairefontaine Multiple Subject Notebooks use two different methods to divide your notebook into sections: by tabs on the right side of the page and by varying the pastel color of paper used in each section. You get anywhere from 4 to 12 sections, depending on if you buy the small, medium or large version of the notebook. The paper in this notebook has a 5 mm x 5 mm grid, so if you write small you can get a lot of notes into one notebook! 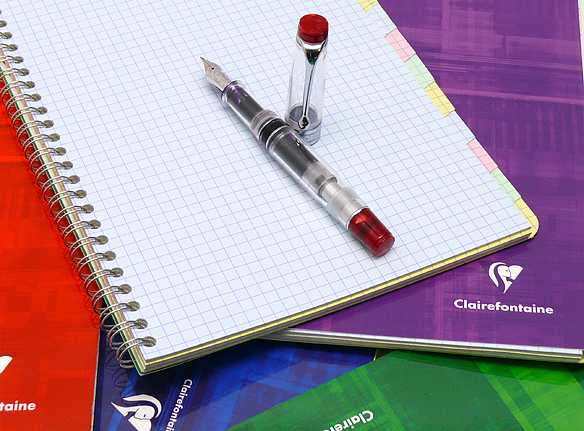 For more information check out our detailed review of Clairefontaine Multiple Subject Notebooks. Clairefontaine Twinbooks have extra white 90g paper that’s divided into two sections by 2 tabs cut into the right side of the paper. These notebooks are side-staple bound so they have a slim profile and there are no wires or discs to get in the way – great for left-handed writers! They come with either a 5 mm grid or ruled paper. Clairefontaine Notebooks with Pockets are divided into three sections of 20 pages by 3 dividers that have 2 storage pockets – one on each side of the divider. These pockets are handy for storing paper receipts, notes, tickets, business cards or whatever slips of paper come your way each day. 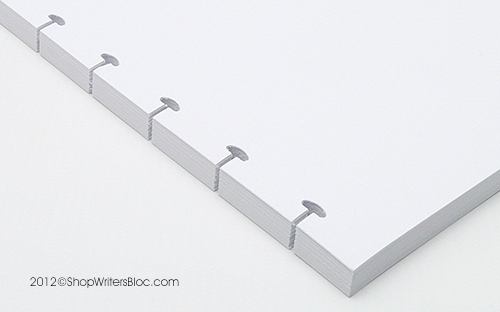 These medium size notebooks have micro-perforated pages so you can neatly remove them from your notebook. Available with tan, black, red, green, blue or multi-color covers. What are your favorite space-saving notebooks? 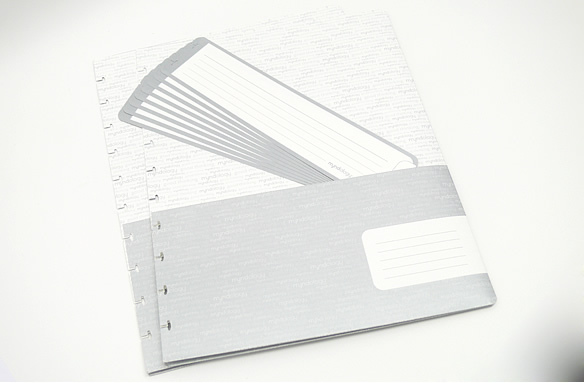 Disc bound notebooks have specially punched loose sheets of paper that are bound together by small circular discs. This binding system makes it easy to customize, organize and re-organize your notebook without ruining your work or your notebook! Companies such as Myndology, Clairefontaine, Levenger, Staples, Atoma and Rollabind have their own versions of disc bound notebooks. 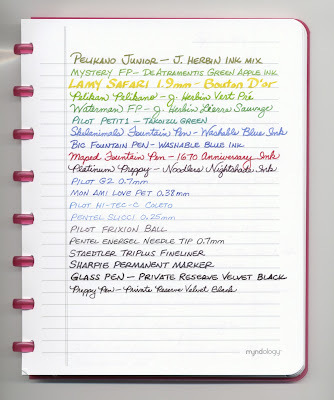 We’d like to answer a few frequently asked questions about this style of notebook. Is the paper interchangeable among the different brands of disc bound notebooks? The answer is yes and no. 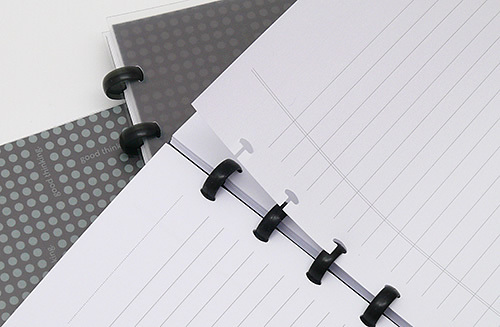 The shape of the discs and shape of the hole punched in the paper of many brands of disc bound notebooks (such as Myndology, Clairefontaine, Staples Arc, Levenger Circa, Rollabind, Martha Steward and Atoma) is similar and therefore the paper can be used with different brands of discs. Mixing brands can make it a little bit more difficult to turn pages, so if this bothers you for best results stick to the same brand. The “no” part of the answer is that paper sizes (and insert sizes) vary from brand to brand which might mean you don’t want to mix brands. For example, if you try to fit a metric A4 size piece of paper (approx 8.25″ x 11.75″) inside an American notebook that takes 8.5″ x 11″ paper, you’ll find that the A4 size paper is too tall so it sticks out the top/bottom of the American notebook. Some medium size American notebooks are 6.5″ x 8.5″, but a metric A5 medium size notebook is 6.5″ X 8.25″ and so on. However, it could be fine if you are using small sheets of paper inside a large size of notebook. Yes, most companies offer a variety of paper refills. One exception is Clairefontaine which, as of this date, has not yet made separate paper refills available for their disc bound notebooks. 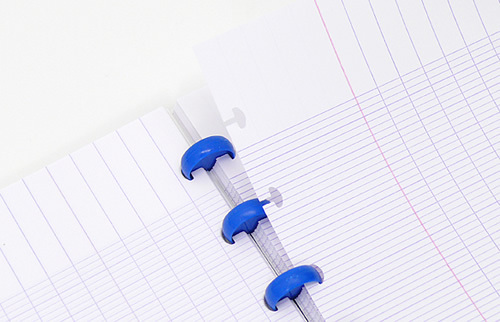 A suggestion for Clairefontaine users: If you’re using a Clairefontaine Clairing Koverbook you can buy a cheaper card stock covered Clairefontaine Clairing notebook and use the paper inside that as a refill for your Koverbook. Myndology offers paper refills with college ruled, graph or plain paper. Can I punch my own paper and make my own refills? Yes, several companies offer hole punches so that you can make your own paper refills. 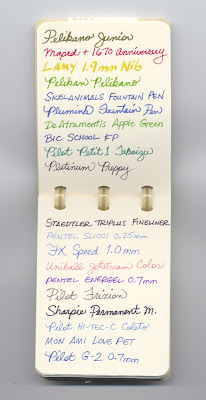 Does it matter what kind of paper I use for making my own refills? Yes, paper quality and weight do make a difference. Good quality paper that is a heavier weight than your average 20 lb copy paper will give you best results in your disc bound notebook. 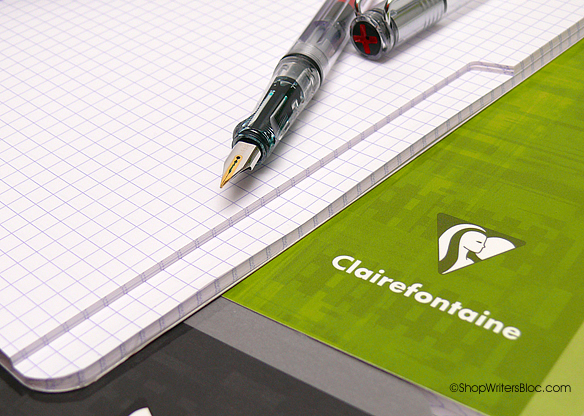 Clairefontaine disc bound notebooks contain 90 g bright white paper that works beautifully with fountain pens. Can I use a punch to make my own covers? Yes, many punches are strong enough to punch through card stock and even light weight plastic. Can I buy accessories like dividers? Yes, dividers and other accessories are commonly available. Myndology offers folders with pockets and 8 movable tabs for both medium and large size notebooks. 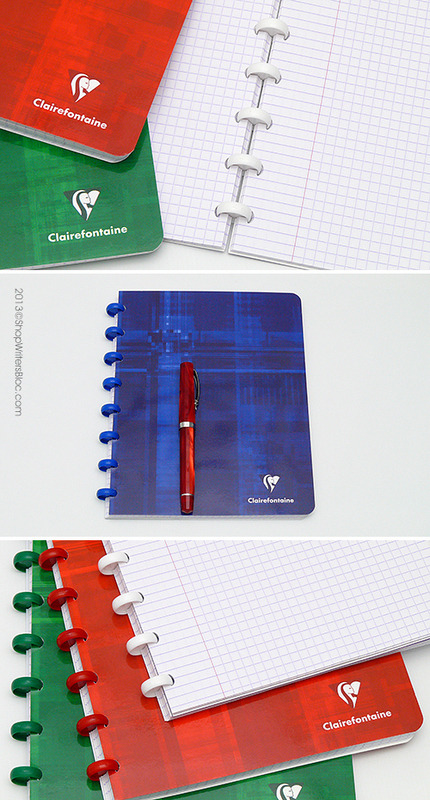 Clairefontaine does not sell accessories separately, instead they include 2 book mark flaps with an integrated clear pockets to store documents, one adhesive label and 5 repositionable polypro dividers with their disc bound medium and large size Koverbooks. Can I buy discs separately? 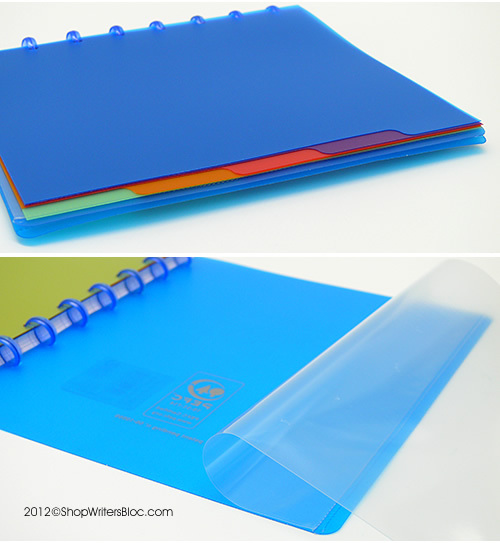 Many companies allow you to purchase discs separately so that you can make your own custom disc bound notebooks. The discs are made from a variety of different materials and come in different colors. Clairefontaine does not make discs available separately, but Myndology does. Can I get different sizes of discs? If you buy discs separately, you’ve got a bigger choice of disc size to choose from. We’ve seen discs that range in size anywhere from 3″ to 0.25″. Of course, products change over time so some of the information in this blog post may change over time too. 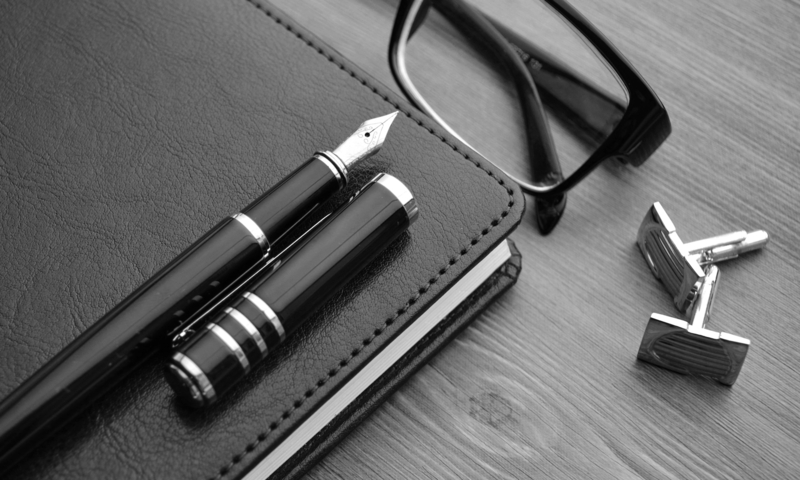 Do you have any tips you’d like to share about disc bound notebooks? Any questions? New discoveries? Ideas? Let us know! Myndology Bare notebooks were created with the welfare of the environment in mind. The folded 100lb laser-cut cardstock cover is made with 100% recycled paper and can be used repeatedly with Myndology paper refills. The cover colors reflect soothing colors of nature such as sand, pine and clay. The front cover has little laser-cut arrows pointing in random directions along with a Myndology logo in one corner. The back cover is plain. Rather than being discarded when the notebook is used up, the 5/8” honey-colored plastic discs are meant to be reused over and over again with Bare paper refills. The discs, covers and paper of all Myndology notebooks are conveniently interchangeable. As we’ve mentioned in previous Myndology blog posts, the disc binding system makes it very easy to add, remove or reorganize your notebook pages. Hydro-electric power is used to manufacture Myndology Bare paper in the USA. The cream colored paper is 70lb Text (104gsm), 100% recycled and is made using a chlorine-free production process. The Myndology Bare Memo pad includes 60 sheets of recycled paper and is approximately 3” x 4” in size. It is also available in a larger 6.5” x 8.5” journal size. Blank paper refills are available for both sizes and college ruled refills are also available for the Bare Journal. What are your favorite earth-friendly notebooks? 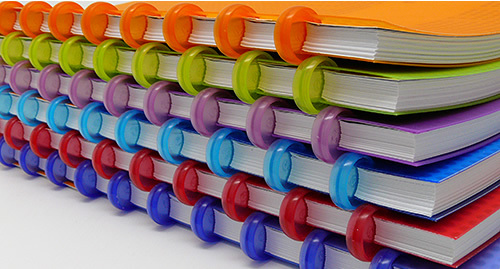 Myndology’s disc binding system creatively allows their notebooks and journals to function like wirebound notebooks that have the added flexibility of a 3-ring binder. You can easily remove, reorganize and add pages and they are refillable. 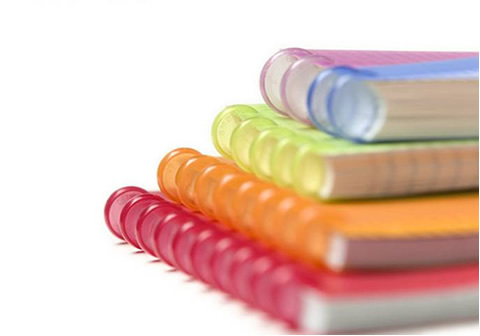 Myndology Sync notebooks and journals feature brightly colored polypropylene covers and matching discs. These covers and discs are interchangeable with other Myndology notebooks and are very durable so they can be reused again and again with Myndology refills. The Sync cover is transparent with a tiny bit of texture which allows you to see through to the contents of the first and last page of your notebook. The journal comes with a white heavy-weight page in the front that on one side is covered with silver print dots interspersed with the words “good thinking”. The other side of this page is silver print with white action words such as “write it”, “add to it”, “an idea”, “pull it out… put it back” etc. This page can be removed or you can leave it in the journal to add a decorative geometric dot appearance to the front cover. The cover and each page of the Sync Journal is punched with a T-shaped or mushroom-shaped punch to comfortably fit each of the discs. To remove pages from this disc-bound journal, you simply pull the page gently from the top towards you (do not pull from the side of the page out). 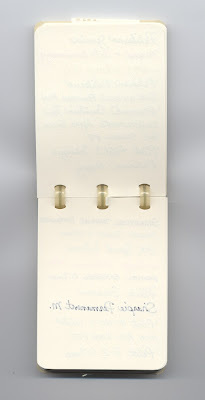 To add pages to the journal, line up the page you want to add with the discs and gently push down where each disc is. It’s hard to describe it with words, so here is a link to a short video you can watch courtesy of Myndology. The white paper inside the Myndology Sync Journal has lots of credentials beside the fact that it is made in the USA: 70lb text, 96brt, SFI Certified, FSC Certified, and elementally chlorine free. In case you are more familiar with metric paper weight, 70lb text translates into 104gsm. The paper is college ruled with margin, and the grey lines are spaced about 3/8” or 7mm apart. None of the lines go all the way to the edge of the page. There is a space at the top of each page for a date or running header and the lower right corner of each page says either “good thinking” or “Myndology”. Myndology created all of their disc bound notebooks to have interchangeable parts – covers, discs and paper – so that you can mix and match if you want. For example, I added a couple of reminders to this journal: one came from a Luna Note pad and the other came from a Bare Memo pad. The notes can easily be removed later when I’m done with these tasks. The Myndology Sync Journal comes with 60 sheets of paper and paper refills or folders+tabs can be purchased separately. 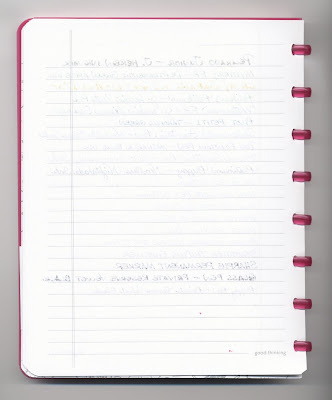 Paper refills for the journal come with 60 sheets and are available in ruled, blank or graph formats. The journal page size is about 6.5” x 8.5” and the eight discs are about 5/8” in diameter. Myndology Sync notebooks also come in letter, index and note sizes. While teaching English in Japan, the creator of the company now known as Myndology noticed that the Japanese students learning English used flashcards bound together by a ring. He decided to use this method of ring-bound flashcards himself to learn Japanese and became addicted to this flexible method of organization. After returning to the USA, a friend’s cat-related study card disaster made him remember those ring-bound flashcards from Japan. He realized that American students could benefit greatly from a similar system of flashcards and started a company called Mindbinders run out of his parent’s garage in Wisconsin. Eventually this company changed its name to Myndology, and also attained the rights to distribute a very cool line of notebooks from Belgium called Atoma. These notebooks are disc bound – another system of binding that creatively allows pages to be removed, reorganized and added with flexibility and freedom. They even sell a punch that allows you to make your own disc bound notebooks! Myndology paper is 100% manufactured in the USA and 100% of the assembly is done in the USA. Only the standard Disc Bound Covers and discs are imported from Belgium. 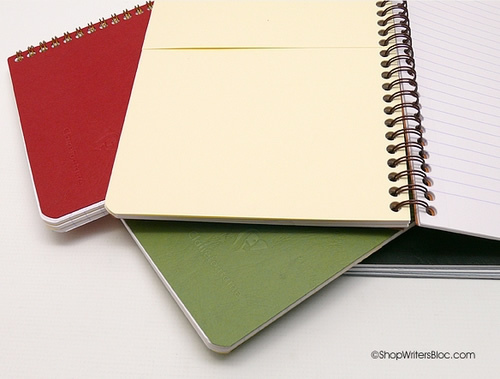 New to Writer’s Bloc are Myndology disc bound journals, notebooks, memo pads and index cards. If you’ve never tried a disc bound notebook and are wondering how it works, here’s a brief video from Myndology that will help you visualize how flexible these notebooks really are.